If you don’t have airport lounge access via your flight ticket, your elite status, via a Priority Pass card from American Express Platinum or via a Lounge Club card from American Express Gold, your best fall-back option is usually No 1 Lounges. All lounges include free hot food, free drinks (some premium food and drinks carries an extra charge), free newspapers and magazines and free wi-fi. No 1 Lounges has generous tie-ups with both avios.com and Virgin Flying Club. This allows you to buy access to their lounges at a discount and earn points in avios.com or Virgin Flying Club at the same time. Full details of the Avios deal can be found here. Full details of the Virgin deal can be found here. If you pre-book lounge access, you will pay a flat fee of £22.50 per person in Birmingham and Edinburgh and £25 in London. This saves up to £15 depending on airport. You will also receive 750 Avios points in avios.com. If you pay on the door – which means you run the very real risk at Gatwick of the lounge being full – you get a fixed discount of £5 on the walk-in price. You will also receive 500 Avios points in avios.com. I think this is a decent deal. Stripping out the value of the Avios takes the net cost down to around £15 and they are definitely worth that if you have a couple of hours to kill. Birmingham and Edinburgh packages also include fast track security. Handy hint: the Avios are awarded per booking. If you are booking for multiple adult guests, make multiple bookings as long as each has their own Avios account. Virgin Flying Club is the only way to earn miles if you want to book the (funkier) My Lounge or (premium) Clubrooms at London Gatwick. If you are looking at Birmingham or Edinburgh, you are clearly better off with the Avios deal which is £2.50 cheaper and gives you more miles. For the No 1 Lounges in London, the pricing is the same with both offers but you get more miles with Avios. For My Lounge or Clubrooms, the Virgin deal is your only option. Even if it’s not the best lounge in the world £12 plus a couple of hundred virgin miles for the MyLounge in Gatwick north seems a decent deal. Do you get fast track security as well? Not sure about fast track as I have the priority pass – however, if I didn’t have priority pass I would consider 12GBP to be overpriced for MyLounge. It really is the strangest lounge I have been in, last time I ended up in there the only choice of food was a pot of baked beans. I will only use it if both the Aspire and Nbr1 are full. Obviously this is just my opinion I am sure others will probably like it but when you have other choices I would rather pay the 12GBP to mcdonalds. OTish…. 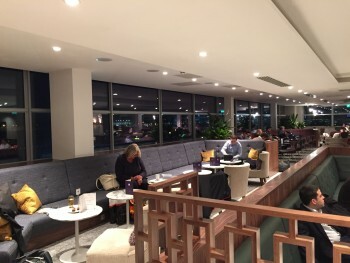 which lounge would people recommend in LHR T3 for priority pass – no1 or aspire? I did a review of Aspire if you search, perfectly pleasant. Little to choose between the two but No 1 is larger. Aspire is newer. Aspire turned me away last month,said they were full. On topic – last summer I bought 8 passes for No1 LGW south (stag do). Booking them individually but each time using my Avios account – I received 8 x 750 Avios. I did need to chase a couple of missing ones a few months later though. Off topic – in 2 weeks I am travelling from LGW North on Thomson (don’t ask!) with check in around 4:30/5am. Any anecdotal experience on lounge busyness around 5/6am for Priority Pass holders? Will No1 be turning people away? I am at ‘churn point’ with my Amex Plat and wondering if it’s worth an extra 3 week’s fees for lounge access on that trip (outbound LGW S, inbound MLA a week later). I have a similar query, so interested to hear any comments. Not really OT but sort of; I’ve managed to use fast track security at STN by flashing my priority pass as it was proof I was using the lounge. Whilst we’re on the topic of lounges I’m off to BKK on Thai in Business in a couple of weeks from T2. Apparently I can use any of the Star Alliance lounges there – any recommendations ? United Club, by a substantial margin. I have reviewed it on here a couple of times. It is lovely. United is lovely but I would suggest trying them all. I did! IIRC you have Lufthansa and others too. Also, don’t forget you have access to the Star Alliance arrivals lounge on your return. That’s if it’s open! Last August (5th Aug I think) there were hardly any lounge staff in T2…i think i was told eventually there were severe staff shortages…and they shut the United Lounge early (6pm) and gruffly refused entry to any non-united passengers. I was on Air China in F.
The Singapore first lounge also had no lounge attendants and the business lounge was quite poor. Hopefully this lack of staff doesn’t happen often! The Lufthansa lounges were fine and were fully staffed. I need to use priority pass lounge at BKK later this month with family (incl. kids). Any ideas how will be I be able to use shower? Do you just ask the purser for the same? Also any recommendation for Priority Pass lounge at BKK will be good. I’ve twice been refused entry to No 1 Lounge in Birmingham recently when using PP. On both occasions the lounge was empty. I was told that they were expecting to be busy later??? On the second occasion I walked in and took photos of just how empty it was and emailed them to Phil Cameron ( who I think is the CEO). My mail was read, but I didn’t receive an acknowledgement. Very poor show. Both times I then visited the Aspire lounge, and received a great welcome. I’ve since visited No 1 when travelling with a Qatar business class ticket, and wasn’t overly impressed with the offering. TBH if travelling from BHX it’s not worth spending any money or points on a Lounge. The food offering at Pret is much better, and get a drink at Weathersppons. Save some money/points for another time. last time we booked No1 and paid £6 for a glass of champagne to guarantee access, sadly this offer is no more. However, I think the £5 to reserve is still worth it if you have PP or lounge club access for free. On the last visit we were upsold to the clubrooms gatwick south, these were great. Unlimited champagne, unlimited al la carte dining, table service and high quality spirits. Granted it was an extra £12.50 each but I think it was more than worth it. I called up and got this offer 🙂 They said it is no more but they let me pay for it! No1 Lounge’s get more and more like Wetherspoons each time I go.